The National Electrical Code requires ground fault current interrupting (GFCI) outlets in bathrooms, kitchens, outdoors and anywhere else water is likely to be present. The breaker inside a GFCI outlet trips when it detects a sudden surge of current, such as would be caused by holding an ungrounded appliance while standing in water. GFCIs have two buttons in front, often colored red and black. The black button is for testing the outlet, while the red one is for resetting it in the event that it trips. GFCI outlets have two buttons on the front. Check the breaker controlling the circuit in which the GFCI is installed if the red button is out and won't stay in when you push it. Reset it if it is tripped and push the reset button on the GFCI again. Unplug all appliances plugged into outlets downstream of the GFCI. 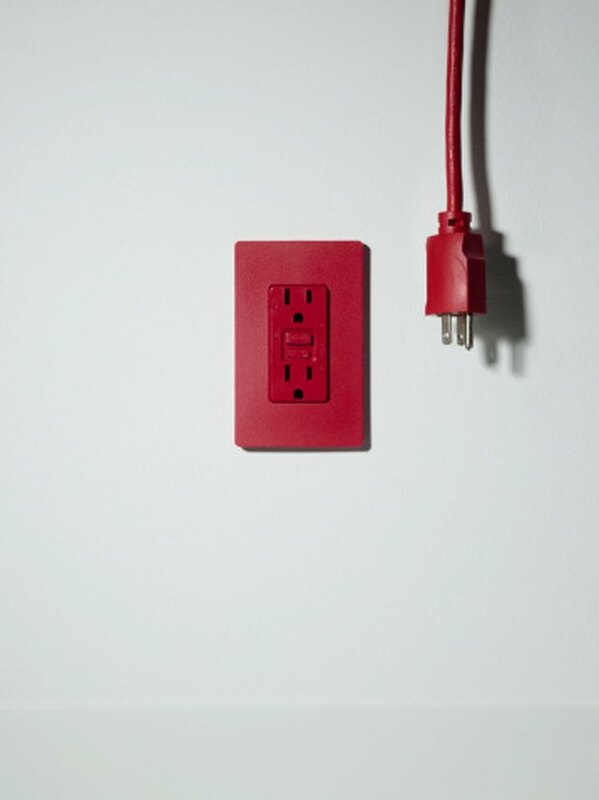 Even though the outlets may not be GFCIs, a faulty appliance or a ground fault in an appliance plugged into one of them will prevent the GFCI from resetting. Turn off the breaker to the circuit and unscrew the cover plate from the GFCI with a screwdriver. Unscrew the GFCI from the electrical box. Inspect the wire connections and verify that the live circuit is connected to the terminals marked "Line," usually the upper pair, and that the cable going to other outlets is connected to the "Load" terminals, usually the bottom pair. Correct the wiring if the cables are reversed. Push the black test button if the red button is all the way in but there is no power to the GFCI or the outlets connected to it. The red button should pop out. If it doesn't, the GFCI is probably defective.